Large first floor*( *2nd floor North America) one bedroom flat overlooking a private garden in exclusive Georgian cul de sac, off Heriot Row. 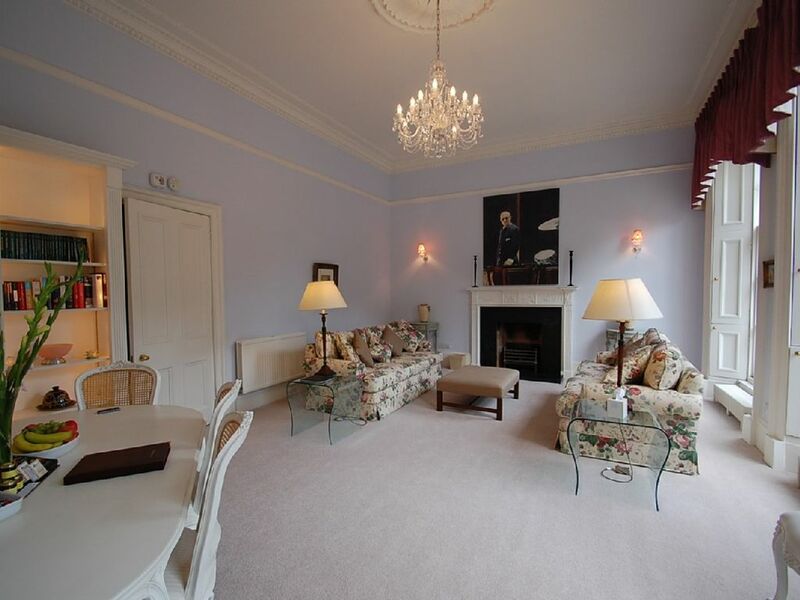 The large living room, which overlooks the beautiful private Queen Street Gardens, has a separate dining area. All bed linen, towels, pillows and duvets are provided. The apartment is a few minutes from Waverley Station by taxi. Wemyss Place is just off Queen Street, which runs parallel to George Street. The main shopping area of Princes Street is within easy walking distance. The apartment also has a secure parking bay at the rear of the building. The apartment is in a very quiet area and yet so close to all the amenities and attractions, within walking distance such as Edinburgh Castle, the Royal Mile, with Holyrood Palace a short drive away. There are many bars, restaurants, coffee shops and boutiques several minutes away in Rose Street. Edinburgh's famous castle is especially beautiful. Upon entering the city, it commands immediate attention. The eye of the visitor is drawn to the impressive structure rising high above everything else on its sheer granite cliffs. There are incredible panoramic views from the upper stories of the castle, including a clear view of the distant sea. The castle sits high on the huge rock formation that juts out as if in defiance of any who would seek to invade Edinburgh. Castle Rock, as it is known, is inaccessible on three sides, and has a long, descending ridge on the fourth side. Edinburgh is filled with historic and literary association: John Knox, Mary Queen of Scots, Robert Louis Stevenson, Sir Arthur Conan Doyle (creator of Sherlock Holmes and Dr. Watson), Alexander Graham Bell, Sir Walter Scott, and Bonnie Prince Charlie are all part of its past. A *25% deposit will secure a booking, *if booked 60 days before arrival. A refundable security / damage deposit of £500.00 will be taken on all bookings. Bookings for less than the minimum number of nights will be considered subject to a surcharge. All duvets, pillows, bed linen & towels are provided at no extra cost. This property benefits from broadband at no extra cost. The maximum occupancy of this apartment is 2 people and it is forbidden for more than 2 to stay overnight.